Some days you wake up, drag yourself out of bed, get through your first cup of coffee and finally make it to the bathroom to find yourself confronted with...just ugh. Lacklustre skin, minor irritations or pimples, dark circles, dehydration. Nothing so horrific that children will run from you in the street, but you certainly don't look fresh faced and delightful like a woman in a fabric softener commercial. Face funk. There's a lot of reasons this can happen and recently for me it was a build up of weeks of neglect. The cold weather descended just in time for Dark Mofo and instead of nourishing my skin, I gave it back to back late nights, very little sleep and lots of wine. Face funk. The main problem with this sort of ugh-ness is, it can be a long road to recovery. You have to do the obvious things- drink lots of water, lay off the booze, get some sleep and eat well. While you're doing that though, here's a few tips to spruce up the old face and distract the viewer's eye until you recover. These face masks are made from (almost) all natural ingredients, not tested on animals and handmade in your country of purchase. Because they are so natural they do have an expiry date and you need to keep them in the fridge. The range features a mask for a variety of skin types and problems, but these are my 2 go tos. 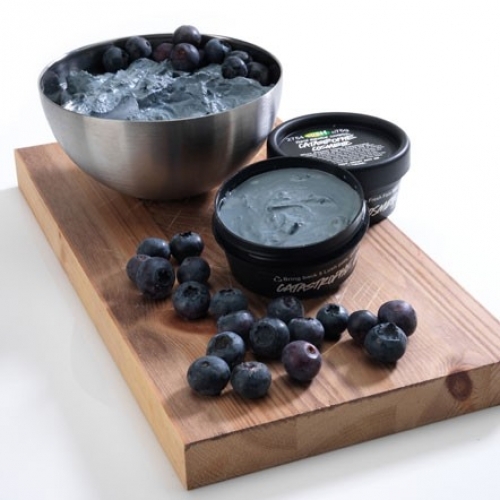 Catastrophe Cosmetic (left)- Blueberries are a super food, but they're not just good for your body from the inside. Rich in vitamins and antioxidants, the blueberries calm the angry redness and their antibacterial properties will help fight breakouts. Also contains almond oil and chamomile, so it's perfect for folks like me with sensitive skin who can't use the more aggressive products for pimples. This one will go hard so remove with a warm, damp wash cloth. 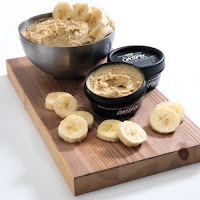 This is useful to figure out if it's the right one for you, because typically face masks that are firm after 10 minutes (also the kind you pull off, clay masks, mud masks and so on) are sucking nasties out of your skin. Those that stay moist (like Oatifx) are putting back. Oatifix (right)- Every time I put this on, it elicits a very particular response from any witnesses. It's a sort of surprised revulsion, because you will look a bit like a swamp monster when you use it. It's a yellowy brown from the banana, and due to the oats and ground almonds it has a slightly lumpy texture. DO NOT be put off by this, but DO drink beverages through a straw cos chunks might land in your cup. The combination of ingredients are extremely gentle and nourishing for the skin, so I tend to put this on every day for 3 days, then once a week til I'm back on track. I love false lashes and would wear them for a night out anyway. However if you're feeling a little bleary eyed, a natural looking lash (I like MAC No. 4s) can be a great way to open your eyes and feel a bit more really to rumble. My major issue is I'm allergic to the latex in lash glue. I used to be able to wear them twice a week without any issues, but more recently the following day my eyes are swollen and red and it takes several days to return to normal. You should never mess with your eyes, so I was at a point where latex free would have to work or I wouldn't be able to wear lashes again. I ordered Duo because I have always liked their regular glue. The latex free version is very different though and it takes some getting used to. Firstly it comes in a tube with a little paint brush, so you apply the glue directly to the lashes rather than squeezing it out and waiting for it to turn tacky. It's a strange iridescent blue when it comes out, but like normal duo, still dries clear. 1- It dries really quickly. Don't wait a few minutes as you would with regular duo, wait five seconds before applying lash to your eye. Without the stretch latex offers, you have to be more precise as you will not have the give to readjust when it's on your lash line. I basically glued Kel's eye together the first time I used it on her. Once on however, this gives the added benefit of keeping them in place, so no need to stick them back down in a dank club toilet at 2am. 2- Latex free Duo is so committed to your lashes, it wants to stay with you at least 3 days into the working week. Again, it's not stretchy, so you can't as easily pull off the remnants in the morning. I use a dual-phase eye makeup remover (oil and water mixture, the kind you shake to blend ingredients) and it still doesn't come off in one go. So both these things are slightly annoying, however since I am pleased to report I have had no reaction at all to this product, it is totally worth it. I have really fine hair and now it's red and not being bleached within an inch of it's life, I'm trying to get some length in it. The problem with this, as anyone with fine hair can attest, is it goes a bit flat. A bit of volume is required so you don't feel like everything above your shoulders looks like a giant deflated souffle. 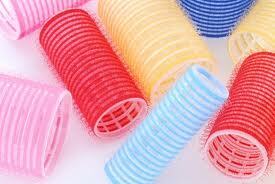 I remember discovering Velcro Rollers back in the 90s and they were the best thing ever. Then we just forgot about them, like hair mousse which is also great for fine hair and now making a comeback in modern formulas. Super easy to put in and get out, I quickly roll my top layers while I'm brushing my teeth and putting on my jewellery. Five minutes later these furry little buggers are making me look less like I've spent the night in an MRI machine with my head wrapped in a damp towel. They're ridiculously cheap too, $3 for a pack of 5 and come in different sizes depending on your length. I love a bold piece, as you know. 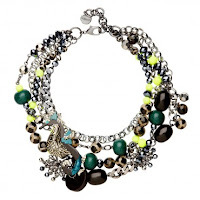 So it's no surprise I'm gonna suggest you make a statement necklace or chunky earrings the feature of your outfit to attract the eye. 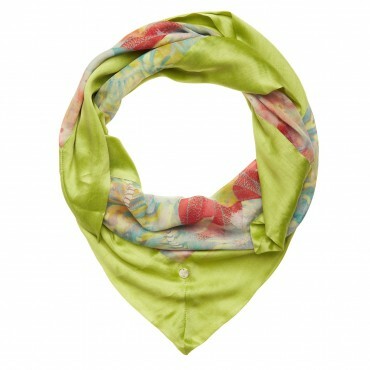 If jewellery isn't your thing, choose a scarf in a colour that compliments your skin tone or brings out your eyes. If you have problems with redness or irritation, try to avoid reds and harsh pinks, because they could just make the inflammation look worse.